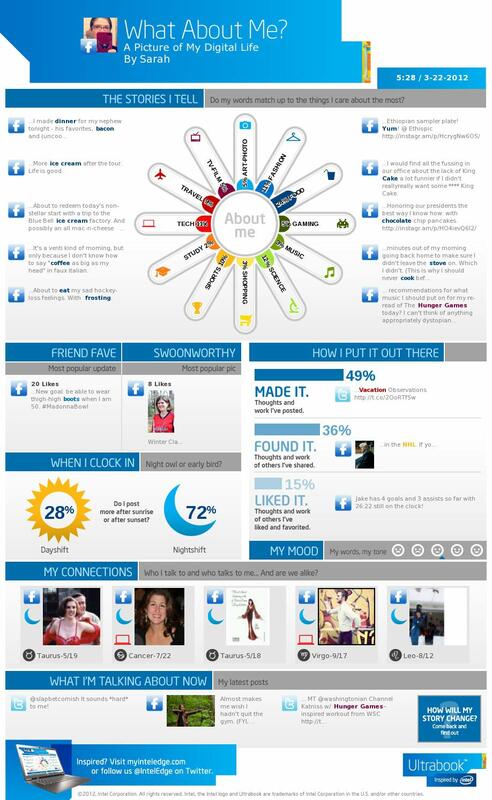 Thanks to the wonders of Facebook link sharing, I found out from my friend Alison today that Intel has launched some sort of gizmo that lets social media users create an infographic of their online lives. There was, of course, no way I could resist making one – and sharing it. Go make one for yourself! It’s fun! Updated to add: Can anyone tell me who the person all the way to the right is under “my connections”? I checked my Facebook friends and don’t recognize the picture at all! I’m leaving out the snarky comment because it is a real person who is a real friend, and I don’t know who it is either, but their birthday is August 12th, so that should narrow it down (check your event calendar). Ah, I missed completely that the birth dates were under the photos. I have now identified the person, and it’s someone old enough that it’s impressive that he’s on Facebook in the first place, so I’ll give him a pass on his oddly-cropped photo. It’s actually of him, shoveling snow, which is impossible to tell in the infographic. And is this cousin Dan? Or some other Dan I know? Or perhaps a Dan I don’t know? Sorry, can’t do this — I neither Facebook nor Twitter — guess this leaves me in the Dark Ages! Tis getting way beyond me. Looks neat, tho!! What about March Musical Theater Madness as a post??? I did the infographic. Meh. I’m underwhelmed.